When Trump's visit to the Saudis wound up with Blackstone's Stephen Schwarzman walking away with a huge benefit for Wall Street plutocrats, a number of other deals detrimental to the public were struck at the same time. 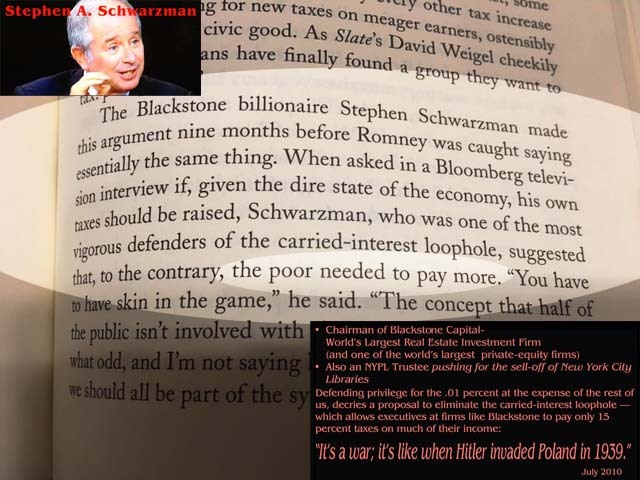 Blackstone head Stephen A. Schwarzman is notorious for pocketing the most income of anyone in the world. So you may very well find it annoyingly disproportionate that in 2016 it was reported that Mr. Schwarzman’s take home for the year in 2015 was $810.6 million. That’s if that kind of extreme disproportion bothers you. And if you are already unsettled by that information, consider that huge portions of Mr. Schwarzman’s income are taxed at less than half the usual rate, just 15%, because of the carried interest loophole that he lobbies hard to keep in place for his continued benefit. Now consider this, which you can learn from Jane Mayer’s 2016 book, “Dark Money, (The Hidden History of the Billionaire Behind the Rise of the Radical Right)”: When asked whether his own taxes should be raised given the dire state of the economy, Mr. Schwarzman said, to the contrary, the poor are the ones needing to pay more in taxes. Wth a huge part of his $810m 2015 income taxed at less than 1/2 the usual rate Stephen Schwarzman says poor should pay more taxes, not he.- Jane Mayer's "Dark Money." There is even more to annoy you if you want to acquaint yourself with some of the ways that Mr. Schwarzman reportedly earns his money. How is it that this man who believes we should take from the poor while simultaneously privileging the rich with such special and unequal advantage should have been given a key role in saying that our NYC libraries should be sold and shrunk, the books banished? Should we add details about how the wealthy were benefitted by these library sales at the expense of the rest of us? War as busine$$ tied to $$ flow to Ivanka (like HRC & Clinton foundation) and Schwarzman's Blackstone. Now consider this about Mr. Schwarzman . . . it’s news concerning the jeopardy other of our national public assets are likely to be prey to. . . Did you note what was reported when Donald Trump visited Saudi Arabia on weekend late this May? Deals were made. .
• Trump signed arms deals to provide the Saudis a record $110 billion in arms (expected to total more than $350 billion over the next 10 years), which will, among other things help support Saudi Arabia’s continued bombing and decimation of Yemen. • a $20 billion investment in Schwarzman’s private equity firm Blackstone Group firm (along with investment is some other U.S. Companies not apparently worth much mention) that is planned to be used as “cornerstone” seed money for privatizing U.S. infrastructure. • The June 1st Rose Garden announcement by Trump that he was withdrawing the United States from the Paris Climate Accord. Saudi Arabia has desperately been trying to stop the climate accord process for years, and does not want, for very obvious reasons, the world to declare its lack of an intent to continue to use carbon-based fuels. And Trump came back from Saudi Arabia and announced that the United States would be eliminating its commitments and pulling out of the Paris climate accord. The privatization of what are normally publicly owned assets and infrastructure often involves straight out transfer of legal title and ownership of public property into private ownership (sometimes it is a murkier transfer of sets of rights, licenses or leases), but the fashion among those promoting these deals is to call them "partnerships," and increasingly they are now being referred to by the jazzy initials "PPPs" as if they are something new; they are not (their promoters have had some of their plans in the works for decades). The Wall Street PR is that "PPP" stands for "Public-Private Partnerships." Those who understand better what the 'arrangements mean from the standpoint of public benefit are more inclined to reverse that and call them "Private-Public Partnerships" because of what happens when the private sector is put in the driver's seat to structure these deals in the way that most benefits the private sector. "PPP" may also be thought of as standing for "Profit Producing Product": Unless you can contort these deals into producing profit (and immediate extra cost to the public) the private sector walks away from them. If a deal involves a heavy-lifting challenge, government will be left to do it alone. "PPP" could also easily mean "Profit Pitted against the Public" or "Profit Pummels the Public." Private profit and public benefit tend to be focused on different goals and agenda, as apt to be at loggerheads than conveniently aligned for `partnership.' Exactly who uses a certain road or certain public asset, at what time of day, day of the week or at what costs and with what ease of access and why they do so, is apt to involve all sorts of external public benefit calculations, but for the private sector seeking profit only one bottom-line objective controls: Pleasing the stockholders, building up their bank accounts. Many, including the New York Times with a requisite quote from an expert in the field, warn that one problem with assuring the public interest is properly balanced and against the private sector’s greed when these deals are struck is that “public officials negotiating these arrangements sometimes lack the financial sophistication and advice to fully understand the deals.” What is probably the far greater concern is that with all the pay-offs to public officials that come with crony capitalism, those same public officials are heavily pressured to at least pretend they don’t understand the harms to the public or excess benefit to the private sector. It was unforgivable to make Stephen A. Schwarzman a decision-maker about selling and shrinking our NYC libraries given his expressed priority of soaking the poor while ensuring that his obscenely unfair collection wealth continues full tilt. It is highly instructive to see how those kinds of priorities played out with the sale of the Donnell Library, the first major library (a beloved central destination library in Manhattan) sold as an example of one of these "Private-Public Partnership" See: Priorities To Be Replicated? : Private Luxury Now Abounding Where Former Donnell Library Stood, A "Replacement" Library Is Nowhere In Sight, Saturday, November 7, 2015. Notably, one of the principal financial private sector beneficiaries of the Donnell Library sale was Jared Kushner, Donald Trump's son-in-law, Ivanka's husband, and now a key advisor/deal maker for Donald Trump as president. Schwarzman was on one side of the deal pushing the library out of public ownership: Kushner was on the side that benefitted. . .
. . . All of this is worth remembering when we ask what is in store for us as the Saudis put billions of seed money into Schwarzman's hands intended to prime the pump for a wholesale sell off of American public assets to the private sector.